Plug-and-play simplicity at a reasonable price. The 25 has the edge over the 37, though. 'Natural Touch' mini keys. Arpeggiator. Pitch/mod joystick. The product designers over at Korg seem to enjoy the challenge of making everything smaller. Over the past few years we've seen the Monotron and microKorg synths, the miniKP 2 effects unit and the nanoSERIES of controllers. Korg seem intent on building the world's biggest range of little products, so the arrival of another diminutive addition should come as no surprise. 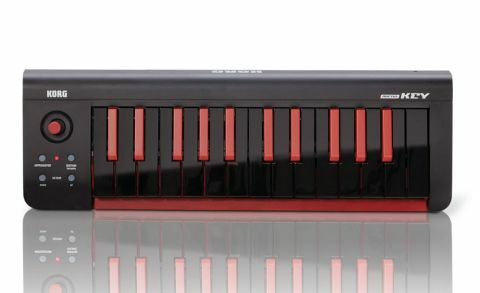 The latest offering is a new version of the microKEY series, which falls somewhere between a full-size MIDI controller keyboard and the ultra-portable nanoSERIES. It aims to give you slightly more control than laptop keyboard options, while still offering a small desktop footprint. "Until now, the only model in the range was the 37-key version released in late 2010. It's now been joined by a smaller 25-key option"
Until now, the only model in the range was the 37-key version released in late 2010. It's now been joined by a smaller 25-key option, which isn't much longer or deeper than the tiny nanoKey, but slightly thicker and significantly heavier. It's USB-powered and sends MIDI over USB only (there are no five-pin DIN sockets). The microKEY models are based on Korg's 'Natural Touch' mini keys, as found on the likes of the microKorg XL. We criticised the light, plasticky action of the Natural Touch keybed when we reviewed the £300 XL+ a few months ago, we're more forgiving when it comes to a £50 controller. The velocity curve can be edited using the Mac or PC-based Korg Kontrol Editor but, as you'd expect at this price, there isn't a great deal of feel to the keys. The unit was recognised instantly by both our Mac and PC and worked without fault. One of the major selling points of the microKEY 25 is its compatibility with the iPad. Again, connection to our iPad (via the Apple Camera Connection Kit, not supplied) was instant and the unit worked flawlessly with every app we tried. Unfortunately, the 25 draws too much power for the iPhone or iPod Touch. The newly designed 25-key version differs slightly from its older, bigger brother. There's a new arpeggiator, and the 25's pitch bend and modulation joystick is tactile and responsive, meaning he microKEY 25 is a valuable addition to this line-up (there's also a new 61-key version). The unit also comes bundled with a small selection of software including Toontrack's EZDrummer Lite and Applied Acoustics' Lounge Lizard Session electric piano plug-in.